The trouble with writing an ongoing blog is, well, you can easily get sidetracked. We got sidetracked by New Orleans. Those of you who know us well will not be surprised. Between some of the best food to be found anywhere and drinks to go, it’s a difficult place to focus. We parked the Silver Submarine at the French Quarter RV Park—a bit of a misnomer, as it’s a couple of blocks from the Quarter proper, but within easy walking distance, which was the main thing. Our first stop in the Quarter is always the Clover Grill. Open 24 hours a day, and serving the “World’s best hamburgers.” And they’re right. It’s a tiny place, made famous (more’s the pity) by the film Benjamin Button. The next day, we were joined by our good friends from Portland, Jen and Casey. They rented a cute little bungalow in the Marigny, a far, quiet cry from the Quarter, though at this time of year the Quarter is surprisingly empty and quiet. Our first dinner was at our favorite restaurant, Irene’s. Irene DiPietro opened this French Quarter beacon of garlic and red sauce in 1993. It is at once a cozy, lively, busy, homey place. We started with soft shell crab and bruschetta. Since there were four of us, we were able to sample dishes including a pan-seared freshwater drum (comparable to snapper); duck breast, roasted crispy and glazed with a raspberry pancetta demi and topped with pecans; and Irene’s signature grilled lamb chops with roasted garlic mash and sauteed haricot verts, then finished with a rosemary port wine demi glaze. There was one more dish that I confess I don’t remember. Then, desserts. A bread pudding redolent with raisins and warm bourbon sauce, and a key lime pie with delectable sweetness. 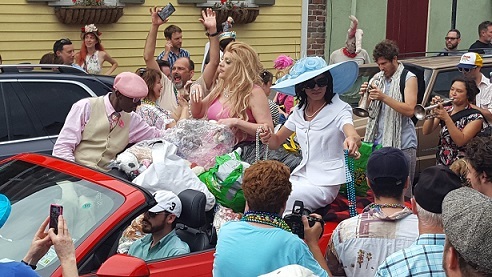 On Saturday, Ben and I walked about 40 minutes to Bywater for the Drag Brunch at The Country Club, “a neighborhood secret for over 40 years.” We had a delicious brunch: Ben had chicken and waffles, and I had debris topped with poached eggs and hollandaise. For those of you who don’t know what debris is: it’s pronounced “DAY-bree.” It’s the crispy ends of roasted pork that are left in the pan when you pull out the roast. Doesn’t sound like much, but all the flavors of the roast and its ingredients, mingled and cooked into pulled pork heaven. Our mimosa-fueled brunch entertainment was a fabulous performance by the Southern Barbitchuates, three lovely drag queens, who worked their way through the restaurant, gathering tips and applause with varying degrees of grace. Southern drag has its own particular style—think big hair and sequined gowns, like Dolly Parton with a dirtier edge. It has a long history here, too; performers inherit the last names of drag houses that predate the 1960s in some instances. That night, we went to a live performance of Biloxi Blues, the Neil Simon semi-autobiographical play about Eugene Jerome, a young recruit who enlists in the army at the end of WWII. He is shipped from his home in Brooklyn to basic training in Biloxi, MS. At boot camp, Eugene is antagonized by a manic drill instructor and is introduced to adulthood through his experiences with a diverse group of young recruits, a Biloxi beauty, and a local prostitute. The performance was put on by a talented ensemble cast at the World War II Museum in the Warehouse district. This being New Orleans, the play was accompanied by wine and a delicious dinner of braised short ribs—not your typical dinner theater fare, but right up there with some of the best food we’ve had. Easter Sunday dawned with breakfast at Elizabeth’s in the Upper Ninth Ward, a bustling little place with amazing food. We started with calas, dumplings made of cooked rice, yeast, sugar, eggs, and flour—then deep-fried, sprinkled with powdered sugar, and served with honey or maple syrup; they’re like beignets with a punch. Though the rest of the breakfast was, indeed, deserving of the “best breakfast in New Orleans” title, it was the calas that made the meal. Grand Marshal, great 70s hair! That night we went to Frenchman Street and wandered from club to club: blues, jazz, R&B filled the air. Some of the best music came not from the clubs, but from street musicians in doorways along the avenue. Our last brunch with our friends, this time in the Marigny. Pulled pork and poached eggs have become my favorite breakfast, accompanied by either a Bloody Mary or mimosa. To go, of course. After they left, we strolled back to the Quarter for the must-stop at Café du Monde, not at all crowded during the week, for the de rigeur beignets and café au lait. On our final day, we drove to the Odd Fellows Cemetery, reputed home of the Gates of Hell. Although we knew it was closed, we also had heard through the grapevine that we could talk our way in with an “offering” and the name of a deceased, both of which we had (though we may have incurred the wrath of the dead by stealing flowers from a nearby graveyard). Does this lead to the Gates of Hell? Does Satan carry a cellphone? with flames in the background, sounded just like an ordinary guy with daytime TV in the background. He apologized and said he could get there in a couple of hours. With no time to wait, we made the excellent decision to visit Dooky Chase’s, in the Treme, for lunch. We were shown to a table—perhaps the very same table our hero, Barack Obama, sat in when he visited. Miss Leah, now in her 90s, has been working the restaurant since 1957. This largely self-taught “Queen of Creole,” who never measures an ingredient—she measures the results—has been inducted into the James Beard Foundation’s Who’s Who of Food & Beverage in America and honored with a Lifetime Achievement Award from the Southern Foodways Alliance. The real fame of Dooky Chase’s, however, comes from the time when blacks and whites couldn’t eat in the same restaurant together—except at Dooky Chase’s. Miss Leah knew that no one would be arrested in her restaurant or a riot would break out. Therefore, all civil rights meetings in New Orleans took place inside. now you find out—The Best Fried Chicken on the planet. Followed by a fresh peach cobbler, right out of the oven. The next morning, we packed up, somewhat sadly, but ready for our next adventure—Mississippi, here we come! Please send some of that fried chicken my way.